There is a superstition that if a baby is allowed to cry during their first four months, that they will develop a habit of crying. Therefore, non-crying cues are quickly addressed, any crying that does occur is immediately greeted with the breast. Of course, the grandparents are always convinced that “immediate” isn’t fast enough. Once the baby is three to four months old, the mother returns to work (farming or fishing). In the morning, before leaving, the mother helps strap the baby to grandmother’s back using a obi-style strap (demonstrated in the video by Leslie Kung). The grandmother then wanders around the village, socializing and exercising, between returns trips from the mother to feed the baby. “As she walks the infant’s head bobs up and down, forward and back precariously, but [the baby] continues to sleep undisturbed” (ibid, 98). These photos are from Okinawa in the 1940’s, taken when the American Military was stationed there. The photo on the right links to Urthman’s Geneology blog with other photos of life in Okinawa. The following photos give some idea of the carrying style. Click here for more. 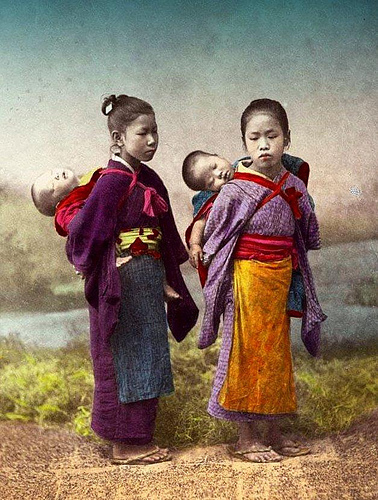 Once the older siblings return from school, the baby is then strapped onto one of their backs. The older sibling(s) are then allowed to be at leisure, but should they ignore the cries of their sibling, their peers will harshly criticized them for it. However, they are prohibited from taking the baby off their back, unless by their mother. Before she returned to work, the mother taught her infant toileting cues, however, once she returns to work the baby is returned to diapers for a few months. After which, the child is put into a long shirt and split-crotch pants and expected to either toilet train themselves or to be taught by older siblings. Now, when these untrained babies, in their split crotch pants, are being worn by their older siblings the only way for them to eliminate is in the carrier, or rather, from the carrier. This is where the strap carry plus split pants can work well, if the wind is in their favor. “H. (an 8-year-old-girl) carrying her baby sister on the back is playing on the beach. She straightens up suddenly with a wry expression on her face. ‘She urinated, wet,’ she exclaims, standing up and spreading her dress at the back which is completely soaked. The baby is bare-bottomed and crowing happily at the older children playing around her. The older sister waves her dress briefly in the wind, then squats to continue to play. When asked if she was not going home to change, she exclaims that she would dry soon enough, and, as for the baby, she was dry. The day is warm and windy and the dress dries off rapidly,” (ibid., 104). There is no “crawling” phase– no one has time to supervise a crawling baby, nor do they want the baby to get filthy on the ground. Yet, though they are not allowed to practice crawling, their babies do learn it as evidenced by the horror stories from mothers having to deal with a baby that was set down and allowed to crawl. No one “baby proofs” their homes–it isn’t even a consideration. Everyone prefers that baby stay safely stowed on someone’s back for the first couple years of life– even the babies seem to prefer being carried, they do not rebel against the carrier. By the time the child is one year old it has seen the entire village, and met (and been met by) everyone in their village. They are part of the “economic and social-ceremonial life” of their community. Every baby’s time in the carrier is limited: they are weaned as soon as their mother is pregnant again, and within six months of weaning they are suddenly no longer carried. In fact, they are shamed by their mothers and siblings for asking to be carried. Maretzki, Thomas W., and Hatsumi Maretzki. “Infancy.” Taira: An Okinawan Village. New York: Wiley, 1966. 94-107. Print. I was so interested to read this and cannot wait for you to add more to the history section! 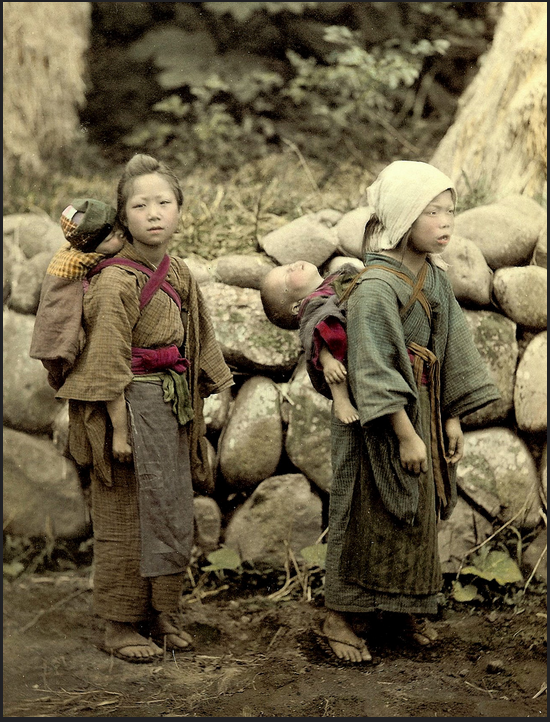 This is a lot more detail than I ever knew about these photos or the baby carrier practices of this culture.